Personalize your 300ZX and set yourself apart from the rest with this awesome NISMO style body side graphic made specifically for the '90-'96 Nissan 300ZX. The graphic is printed with our DuraCOLOR Thermal Process in three (3) different color combinations which all feature a light Black outline at the outside of the graphic. Kit is packaged with one (1) graphic for each side of the vehicle. Three (3) 5" (12.70cm) "NISMO" decals are included at no additional charge! Graphics are set to be located .5" (12.7mm) below the window trim, are very easy to install and simply require light trimming at each door jamb and at the fuel door. 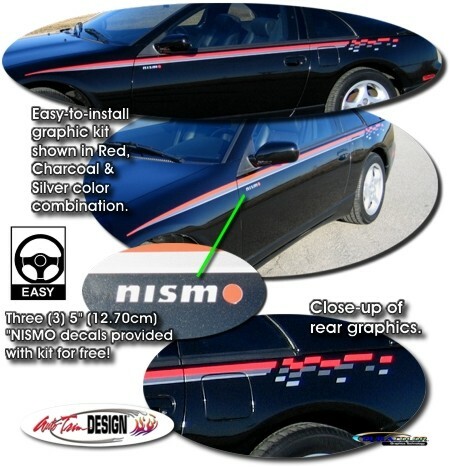 While graphics are made specifically for the '90-'96 Nissan 300ZX, they may be used on other Nissan vehicles as well!